Are we saying like Dino Melaye like Ben Bruce? Are we saying like Dino Melaye like Ben Bruce? Do we? Melaye has always been a loyal supporter of Senate Bukola Saraki, and he has NEVER hidden that fact. In fact, he follows him almost everywhere and that is also a known fact. When the Senate was resumed this week, Melaye proudly took a white handkerchief and, shortly before his arrival, cleaned up the Senate President's seat, saying he needed to clear her jazz. In fact, another senator hugged him. How many more would you like to call us? They are too numerous. Now the other loyal man in the block is Senator Ben Bruce. Bruce recently started fighting for Atiku before becoming the presidential candidate for PDP, and in fact he bravely announced ahead of the PDP primaries that Atiku was his candidate. He was also part of Atiku's entourage to Port Harcourt for the primaries. 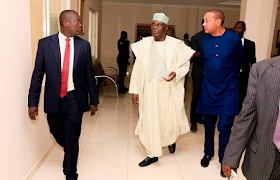 Today, Atiku was in Abeokuta to visit ex-president Olusegun Obasanjo and Ben Bruce was LOYALLY with him (as seen above). Is Ben the newest loyalist of Atiku? Like Melaye, like Bruce?